First of its kind Spring Assist knife, this model features the highly sought after out-the-front action. This is a true new production technology spring assist knife, not an illegal stiletto automatic. Fast action spring assist knives give you a tactical advantage when every second counts. Bought it for my wife.Needed to oil it up a little to make the switches easier to work.But after that it works nice and smooth.Used a little gun oil.Wife carries it everywhere. This is a decent quality assisted open knife. A bit difficult to operate but should loosen up with use. A nice knife to keep in my car for emergencies. One for myself one for my girl with engravings. Though from watching a couple YouTube videos, I thought the engravings would be much larger. But still sharp solid knives. I was able to open and close mine with one hand in under a minute. Was also bummed that the rainbow version was not in stock for my girl. Still a good purchase. I bought this Knife for myself about a month ago. I am very pleased with the sharpness of the blade out of the box. The handle is a plastic material making it light weight and a very easy to carry. Also, adding the engraving tops it off In overall look. Worth every penny. It is awkward and time consuming to get the blade out for use....too many safeties and buttons to push. It also doesn't lock into place, you have to pull it a little to get it to lock. With a little use I am hoping it will fully extend and lock on its own. 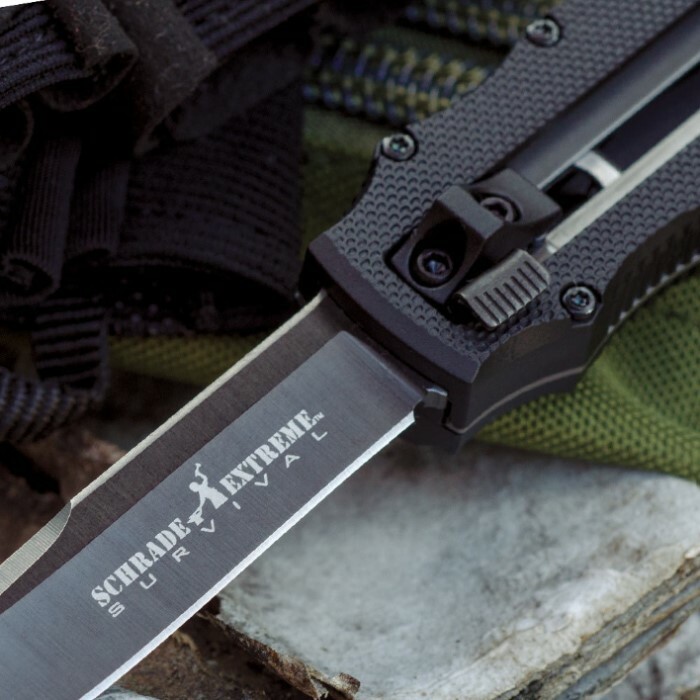 The Schrade Extreme First Generation OTF Assisted Opening Pocket Knife was a gift to one of my children. He was very pleased with the knife in all ways.